The Chinese government has temporarily lifted a ban on selling foreign video games consoles, paving the way for firms such as Sony, Nintendo and Microsoft to enter a lucrative market. A grey market in the sale of consoles has continued in the country. But, partly as a result of the ban, PC gaming dominates - capturing two-thirds of the $13bn (£8bn) market. In a statement, the government said that it would allow foreign firms to make consoles within Shanghai's free trade zone and sell them in China after inspection by cultural departments. But China's State Council did not say how long the suspension would last. In response to the news, Sony said: "We recognise that China is a promising market. We will continuously study the possibility, but there is no concrete plan at this stage." 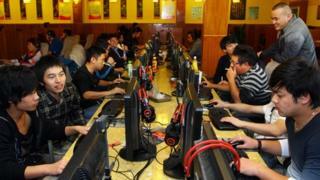 China's video game market is rich in potential. In 2013, it grew 38% from the previous year to reach 83bn yuan ($13bn), according to data released at the annual China games industry conference in December. Chris Green, an analyst with Davies Murphy Group, told the BBC that the decision to liberalise the market was "huge news". "This is an enormous market worth potentially tens of billions of dollars," he said. "Now this is going to be a race to see who can be first to market, who can get a factory in the Free Trade Zone up and running and get consoles off the production line the fastest," he added. He thinks Microsoft may have the edge on Sony and Nintendo. "Sony and Nintendo have their own factories but Microsoft outsources its hardware and could be the best-placed to gear up and get a third party electronics contractor to start making the consoles," he said.